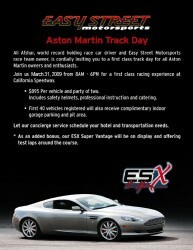 The Aston Martin Track Day, by Easy Street Motorsports and race car driver Ali Afshar will be held at California Speedway on March 31 st 2009 from 8am – 6pm. The Track Day event will attract Aston Martin owners and enthusiasts from all over the country, with a range of cars like the V8 Vantage, DB9 and DBS. 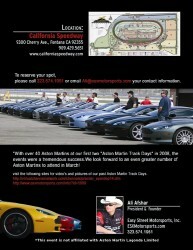 The day will allow the owners to experience the performance of their Aston Martin in a safe environment. The Vantage Collection will also be at the track day to showcase its Aston Martin performance products and Carbon Fiber parts.